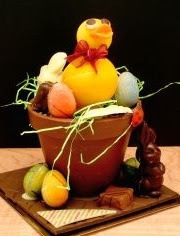 Spring has sprung — and so has the annual Easter collection of signature chocolate confections from Thomas Haas Chocolates & Patisserie. For 2014, Thomas Haas’ selection of melt-in-your-mouth Easter Truffle Eggs is available in three exotic flavours: milk chocolate infused with fennel pollen and cinnamon, dark chocolate with the essence of lavender, and white chocolate accented with tangerine-lime for $1.80 each. Also headlining the holiday collection is aHandcrafted Easter Chocolate Box, featuring an assortment of nine delectable Easter truffles in an edible package as pleasing to the eye as the palate for $39 each. Thomas Haas also offers a wide selection of Easter-themed treats such as solidChocolate and Truffle Lollipops (truffle $2.5/five for $11; chocolate $2.9/five for $13);Easter Truffle Eggs, available in single- ($2) and triple-nest ($5.8/four for $20) sizes as well as an egg-carton dozen ($18); Mini Bunnies in single- ($2.5) and triple-nest ($6.5/four for $22) varieties; a Crispy Gianduja Egg combining sweet hazelnut crème and puffed rice ($7); and an Easter Nest, featuring an assortment of delectable truffle eggs and treats nestled in colourful straw grass in both small (eight pieces, $9.5) and large (20 pieces, $29) sizes. All 2014 Easter products are available at the two Thomas Haas patisseries in North Vancouver and Kitsilano, with a limited selection also available at high-end retailers such as Whole Foods and Urban Fare. A variety of items may also be ordered online atthomashaas.com and shipped across North America. The ninth edition of Thomas Haas’ annual Charitable Easter-Egg Raffle is bigger and better than ever, with 20 delectable Easter prizes — including four ornate eggs measuring 28 lbs, more than two feet in height and valued at $1,000 each — up for grabs. Raffle tickets are $5 each and the draw will be held on Friday, April 18 at 2 p.m.simultaneously in both the North Vancouver and Kitsilano locations, with 100 per cent of the proceeds going directly to KidSport™ North Shore and Canuck Place Children’s Hospice respectively. ONE! Bar 2.0On April 1, Thomas Haas will release Version 2.0 of his popular and exclusive Grand Cru cocoa ONE! Bar, sourced from the highest-quality, wild-foraged cocoa beans from Bolivia and available in a limited-edition batch of only 879 bars. Thomas Haas is the only chocolatier in Canada and one of only a handful worldwide to have access to this unique vintage of 67-per-cent cocoa. Available only at the two Thomas Haas cafés in North Vancouver and Kitsilano and at high-end retailers such as Whole Foods and Urban Fare, each ONE! 2.0 bar is handcrafted by Haas and his team of chocolatiers with a singular focus on cocoa origin and purity.